If you’re visiting one of our Orange County offices for the first time, we’d like you to know exactly what to expect. Your comfort is our first priority! Twins Chiropractic and Physical Medicine has locations in Placentia, Costa Mesa, Garden Grove, and Irvine for your convenience. 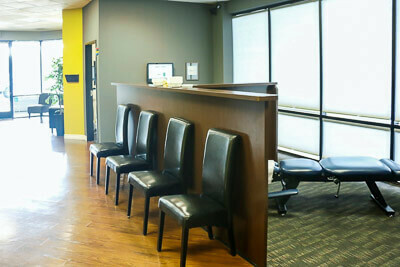 You’ll find that each office is warm and welcoming, with friendly doctors and staff and an open atmosphere. We cultivate an upbeat environment, but one that’s also soothing and relaxing. Feel free to download our paperwork and fill it out in the comfort of your own home! Upon arrival at the office of your choice, you’ll be warmly greeted by your first name by one of our staff members, who will provide you with some new patient paperwork to fill out if you haven’t already downloaded it from our website. If you’re suffering with substantial pain on this first visit, appropriate adjustment may be advised to diminish inflammation and reduce irritation of the nerves. Please plan on this first visit being approximately 30 to 40 minutes in length. During this visit, the doctor will provide you with a report of findings. This report is an explanation of the results of your combined examination testing. We’ll also recommend a customized chiropractic care plan to get you out of pain and on the road to wellness as quickly as possible. We’ll estimate the length of time necessary to complete your program, as well as your initial frequency of visits. We’ll make sure that you know exactly what we can offer in the way of help, support and education. The doctor will also review your insurance coverage at this time, or, will design an affordable financial plan for you if you’re ineligible for chiropractic benefits at this time. Specific treatment usually begins on this second visit. A typical office visit is 10–15 minutes in length. When you arrive at the office, you’ll be given a PIN number to sign in on our paperless filing system. Your file will then be forwarded through our digital network apparatus to the selected treatment room. The doctor will adjust specific areas of your spine or extremities on each visit, and then you will be placed on a gentle roller table to relax your muscles and help your body to hold the adjustment longer. Just think of your adjustments as giving your body an oil change. Most people come in when their engine is really “fried” and a lot of work has to be done to restore it so that the engine runs smoothly again. Most people have never experienced the joy of a body that feels optimal, where everything is moving properly. When a patient experiences this for the first time, they naturally want to keep that feeling going! When you get adjusted on a regular basis, your awareness of problems in the making is heightened, and conditions are never allowed to spiral out of control. This aligns beautifully with the desire to be healthy —just like getting your teeth cleaned twice a year or showing up for an annual physical. We’d love to welcome you to our practice family. Reach out to an office near you to schedule an appointment!